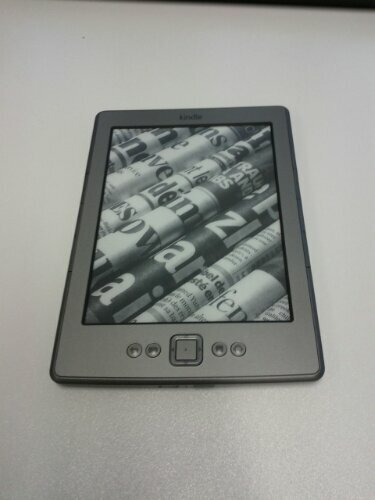 Yesterday, my all new Kindle arrived. Screen size 15cm, weighing only 170g. Why? To read more. Well, this was my excusion to myself. It really is a fascinating device. The contrast of the screen is very high and reading makes much fun with it. If you are reading books formatted in the .mobi / the kindle format. Using this format, you can change the font size and it automatically adjust itself. On constrast, if you want to read PDFs on this small screen, you may have luck that the page size of the PDF is very small and, therefore, the letters are readable. As the font size cannot be changed, you cannot increase it. But most PDFs have DIN A4, US LETTER or DIN A5 as their format. Or something in between. Some may have two columns (which is common in scientific papers from IEEE) and others footnotes…. All these kinds of things makes a PDF very hard to read on the Kindle I bought. So, what can be done about this? Buy a Kindle DX. This Kindle has a 9.7″ screen size and costs $380. Rotate the screen to landscape mode for having a little higher font size. You can only zoom in. I don’t want to buy a Kindle DX as it is too expensive, has to be bought from amazon.com and shipped from the US. I have tried to rotate the screen. It works for some cases, but it is for from perfect. Zooming makes everything only worse. Trust me! I testet the conversion tool named K2pdfoft which optimizes a PDF for a kindle device. The results are quite ok for the PDF I testet (one column, scientific, with tables, footnotes). I will post more about conversion tools and compare them with each other testing various scientific paper styles in the future. In the mean time, I will read my books which have the mobi format. PS: If you buy books at http://manning.com or http://pragprog.com, you get the eBook as a PDF, mobi and ebug DRM free format! This is really cool! PPS: I will try to be a more active blogger. 🙂 Especially as I have a new design!!!!!!!!!! For my proposal of my diploma thesis, I worked with TeXnicCenter which worked quite well. However, this can be improved further with the integration of sumatraPDF. Following the instructions on sumatraPDF Google Code Project Wiki under the Heading TeXnicCenter, the ultrafast sumtraPDF shows where the current cursor is in TeXnicCenter and updates when the TeX files are recompiled. This allows to increase productivity, as by using F7 for compilation of the project and F5 for refreshing the sumatraPDF, no closing, restarting, etc. has to be done to see the new changes made. Using the one half of the screen for TeXnicCenter and the other half for sumatraPDF (by leveraging the Split Screen technology from Win7), this works like a charm for me. You should try this out, too! 2. iThoughtsHD: Used to draw Mindmaps with an easy user interface. Can access Dropbox itself. Why does the trio so well? For fun, i can only recommend Monkey Island 2 on the iPad. Mostly about Programming. Or cool new electronic toys.